The paintings of Alexandre Hogue came to town. 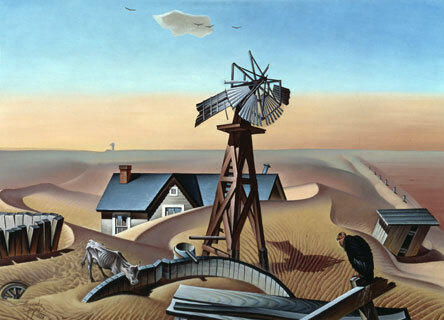 Hogue was the Dust Bowl painter of the Great Depression. Someone at the museum has a dark sense of humor, to show those paintings around here. Still, Kayla and I packed our picnic basket, to stay within budget, and went down to the museum to look at the paintings. 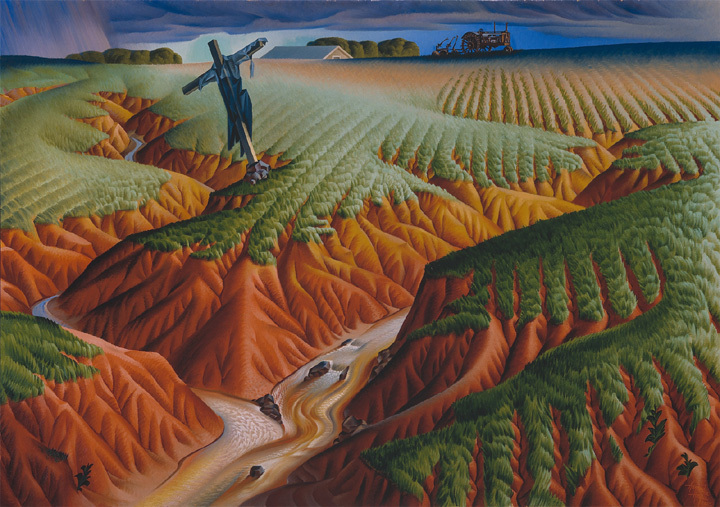 Houge depicted the soil erosion of 1930’s industrial farming, and the ensuing dust storms that transformed the landscape. He painted the failed farms of the Great Depression. In The Crucified Land, a muddy ditch opens in the foreground of the painting and rips gashes out of the field. The vertical rows of the crops point to the tractor. Hogue blamed the machinery of corporate farming for devouring the soft crust of the earth and throwing the crumbs to the wind. There are no people in the Dust Bowl paintings. The people on the farms did not make it. My great-grandpa would tell of the Depression. They ate fried eggs every day, and homemade bread; there was nothing else. How could he explain it to children? It was the unreality of history. Houge told it this way: A busted windmill stands in front of a house. The house is buried in the dust of a thousand farms. A cow stares into an empty trough. A buzzard waits for the cow to finish dying. The texture of Drought Stricken Area is red grit sifting from the canvas into your shoes and behind your neck and down your throat as you stand in the museum and look at it. If you kept great-grandpa talking about the Depression, he would tap his cane on the porch and smile and tell of their little escapes: the cinema in Shiner; picnics beside the green river. Not everyone made it, he said; we made it. I started my farm business four years ago; the first year of this drought, the first year of the recession. The drought has changed the ecology of the land. The recession reset the context. I wonder what Kayla will tell our great-grandchildren of now, of this time. Even if I live to be old, I probably will never meet them; but Kayla will. I wonder if she will tell about the exquisite irony of fried eggs and toast. We need a new painter, to help her tell it. We need a painter for this time, this recession, this drought. The new painter will show Kayla in her red dress, after church, standing in the garden, about to pick a watermelon. The light is from the top, harsh sunlight. Her dress is defiantly red against the papery brown corn stalks and her hair is up in braids. Behind her, sunflowers grow in a thick hedge, tight gray-green vertical lines, 20 feet tall, and no yellow flowers at the tops. Nothing moves in the heat of the painting, not the corn stalks or sunflowers, not the lizards in the sand, not the alligator eyes in the lake, nor the hawk in the distant tree. Only the woman moves as she reaches down with both hands for one sweet thing in the ravaged landscape. Another painting will show a garden of freshly tilled black soil. The long rows form horizontal lines in the foreground that run parallel up the painting, shrinking into the distance. The lighting is indirect from the left, morning light, the sun behind the trees. The sky is pale blue, the clouds over the Gulf pink and golden in their billows. The eye climbs the garden rows like steps into the far distance, to the shape of a woman, tiny, with her hair up in braids. If you look closely at the painting, close enough for a security guard in the museum to clear his throat, you will see that the woman is kneeling beside the first row. Sacks of seeds surround her, and she pushes each seed into its place in the soil, and shifts herself down the row. The painting cannot show the light move from the left to the far right, the rich mauves of sunset draping the distant trees. The woman has worked all the way down the garden to the foreground of the painting. She is now perfectly clear, filling the frame, the center of the composition, still planting seeds, injecting life with her fingers, life to the painting, life to the world. I wonder if she will tell our great-grandchildren about our picnics; how she carefully laid out the food we grew on a blanket; how we ate till we were full; how she rested her head on my shoulder and we slept outside the museum in the shade of an oak tree. I wonder if she will tell of the museum–our escape. If she will tell how I stood to the side at the Hogue exhibit and watched her move down the line of paintings, savoring each one, more beautiful than each one. I wonder if she will tell that we made it. Thanks! We are doing great, and looking forward to the cooler weather, just ahead! Thank you! You don’t need a painter or a painting. Your words paint the image in our minds and heart. Blessings to you and Kayla.